Kamchatka snow sheep lives in the same areas as the brown bears. For the anglers it's hard to find more suitable place than Kamchatka is. We organize hunt in Palana region where you should fly from Petropavlovsk Kamchatsk city by regular airplane. You don't need helicopter during this hunt. Fishing for halibut, king salmon, trout and other species will give you unforgettable memories from the trip for the whole lifetime. You will be able to hunt brown bears in Kamchatka: till 500 kg weight and till 3 meters length. We organize that hunt in Palana region. No need helicopter during that hunt. You arrive to Palana town from PK by regular airplane. Get your BIG bear with us! We organize hunting in Russia for Moose near Kamchatka river in middle part of Kamchatka peninsula NO NEED helicopter for that hunt. Season is September 10 – 15 December group size: up to 1-5 hunters. Accommodation wooden house, have Russian banya. Hunting methods: Many Moose get together during rutting at the regions of camps. Hunt by foot (1x1). The hunting methods are the following: looking for track and following it till find moose. Movement during hunt by use horses and snowmobile. Russian Caucasus is important hunting destination. Here you can hunt for Kuban (western tur and Caucasian chamois. Hunting is conducted on the height of 2000-3500 m. For this hunt you need from 8 days. Group can consist from 1 to 3 hunters! Russian Caucasus is important hunting destination. Here you can hunt for Mid Caucasian Tur and Caucasian chamois. Hunting is conducted on the height of 2000-3500 m. For this hunt you need from 8 days. Group can consist from 1 to 3 hunters! Here you will be able to get Marko Polo, Afghani urial and Siberian ibex. We organize hunting on wild boar as well. Hunting on wild boar and ibex is conducted on Pamir along the borders with China and Afghanistan. This area long since has been considered a place where the biggest wild rams of Marko Polo inhabit. Hunting is conducted on the height of 4000 m. and higher. Physical training is the primary factor influencing on the result of hunting. At standard conditions hunting on wild ram is conducted from the distance of 300-400 m. up to 500 m. Duration of tour is 14 days. Yakutia sheep hunting is one of important hunting in Far East of Russia. Hunting is not easy and hunter should be ready for long walking. Season is August and September. Group can consist from 1-2 hunters in group. Duration is 10-13 days. Okhotsk sheep hunting also is going in Far East of Russia. It is Khabarovsk region. For reaching hunting place we use helicopter. We stay in tented camp of above 1000 meters. Camp situated close to hunting ground. Season is August and September. Group can consist from 1-2 hunters in group. Duration is 11 days with road. Koryak sheep hunting in Russia! This sheep lives a little higher than the Kamchatka sheep but still in Kamchatka peninsula. Hunting is about same as for rest Russians sheep. Season is August and September. Group can consist from 1-2 hunters in group. Duration is 10-13 days. Hunting for Maral in Kazakhstan can be really interesting trip for any hunter! Season from September to November but best time is during rut time about middle of September. Qroup can be consist from 1 to 3 hunters. Duration of hutning from 6 to 10 days. Iran is very interesting country for serious hunters. In Iran you will be able to get following animals: Bezoar Ibex, Persian desert Ibex, Trans Caspian urial, Red sheep, Armenian sheep, Isfahan sheep, Kerman sheep, Laristan sheep, Shiraz sheep, Arak sheep, Goitered gazelle, wild boar and Asian brown bear. Depending on animal the hunting is conducted in various areas of Iran: Heidary, Parvar, Saluk, Sarigpol and Khoshyeylagh hunting reserves. Hunting is conducted on the height of 2500-3000 m. Duration of tour is 6-10 days. Everybody is aware of such animals like Maral, perfect Siberian ibex and Roe deer that inhabit Kazakhstan. We have got several hunting households in district Jungar alatau. These are Kumbel, Koyandy Tau and Shahan. Hunting is conducted on the height of 2000-3000 m. Duration of tour is 12 days. In Kyrgyzstan we offer you to get Marko Polo, Siberian ibex of and wolf. Hunting is conducted in mountains of Tian Shan on the height of 3000-3500 m. You will be settled in one of 5 mountainous camps. Duration of tour is 9-12 days. In Kyrgyzstan we offer also hunting for Mid Asian ibex and wolf. Hunting is conducted in mountains of Tian Shan on the height of 25000-3500 m. You will be settled in one of 5 mountainous camps. Duration of tour is 8 days . Hunting in Mongolia has high rank of trophie hunt in Asia. Here you can hunt: Altai Argali (Ovis Ammon Ammon), Khangai Argali (Ovis Ammon Mongolica), Gobi Argali (Ovis Ammon Darwini), Altai Ibex (Capra Sibirica Sibirica), Gobi Ibex (Capra Sibirica Hagenbecki), Siberian Roe Deer (Capreolus Capreolus Pygargus), Siberian Roe Deer (Capreolus Capreolus Pygargus). Hunting is conducted on the height of 3000-4000 m. Duration of tour is 7-14 days. Nepal is seemingly the most exotic hunting area in Asia. Himalayan Blue sheep and Himalayan tahr are very important trophies for all hunters. We organize hunting in the western part of the country at “Dhorpatan” Hunting Reserve as well as in the eastern one at Kanhendzonga Conservation Area. Hunting is conducted on the height of 2500 m. and higher. Duration of tour is 11-17 days. Hunting in Pakistan is a very serious trial that requires one’s being in a good physical form. Here you can get Himalayan and Sindh ibex, Kashmir Markhor, Astor Markhor, Suleiman Markhor, Blandford urial, Punjabi urial, Afghan urial, Blue Sheep. Interesting hunting on wild boar should me mentioned as well. You will find a lot of hunting zones in Pakistan. Hunting is conducted on the height of 3000-3500 m. Duration of tour is 5-10 days. We offer you to hunt in Turkey as well. Hunting on Bezoar Ibex and Chamois is conducted in Antalya. Hunting on wild boar should be mentioned as well. Hunting is conducted on the height of 2000-2500 m. Duration of tour is 6-7 days. Russian Altai is one of interesting place in hunting word. 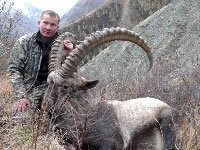 Here you can hunt Siberian Ibex and Maral. Hunter will see real hunting where nature be very close to you. Hunting is conducted on the height of 2000-3000 m. For this hunt you need from 8 to 12 days.